Don’t you just love Christmas trees? They have the magical ability to change even the drabbest of environments into a beautiful, enchanted wonderland of twinkling possibilities. I can never make up my mind if I like the multicolored or the white lights the best, or maybe all one color, like red or purple (purple does stand for royalty you know). And then there is the decision to twinkle or not to twinkle. Although now, with all of these modern techno gadgets you can twinkle fast, or gradually fade in and out, twinkle in time with the carols even. Too fancy for me. I have enough problems with just twinkle or not. I remember the tree my family had when we were growing up. It to was artificial. Dad would set it up a few weeks before Christmas and my little brother, Jay and I would help him. The first thing we would do is sort all of the limbs out by the color of the tip. Then Jay and I would take turns handing dad the limbs according to the tip color he needed next. Dad would put all of the lights on… strictly colored and always twinkling. Then the ornaments would go on. No garland, no ribbon, no tinsel. Just the lights and the ornaments. 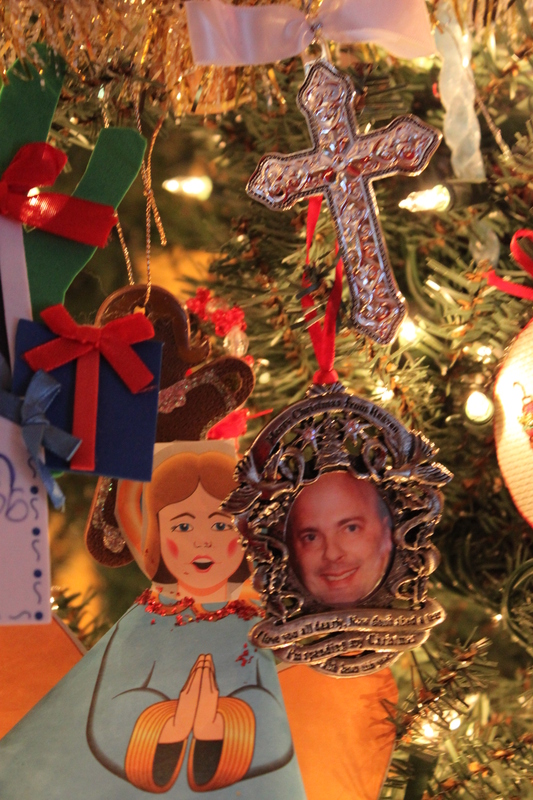 Jay and I could put our ornaments on and any others that wouldn’t break, but only dad could put on the glass ornaments. We knew better than to touch them. One year though, my parents left us home… alone. We must have been like 11 and 9 or something. My youngest brother, Kipp, wasn’t born yet, so we couldn’t have been any older than that. We used to accomplish some pretty amazing feats when we were left home alone, Jay and I did!! One time we created the worlds largest house of cards. It took up the whole living room floor. We used up every deck of mom and dad’s bridge cards in the house and just to make it really pretty, we mixed them all up too. We left it up when we went to bed so that mom and dad could see it when they got home, cause it was totally awesome! We also left the TV on, cause we couldn’t get to it to shut it off without destroying our beautiful house of cards. Jay and I found out the next morning that mom and dad weren’t quite as impressed with our beautiful house of cards as we were. It took a really long time to get those decks of cards all sorted out again too. On this particular night, Jay and I decided that this year we were going to surprise mom and dad by putting the tree up all by ourselves! They were gone at some Christmas-y function and we thought the tree should be up by now, so we decided to go ahead and just do it. We knew the routine by now. Get the stand out, put the tree-pole in the stand, sort out the limbs by color, put the limbs in the pole by color, next is the lights and finally the ornaments. By this age we felt fully qualified to handle the glass ornaments. These glass ornaments weren’t just the boxed glass ornaments that you can buy at Wal-Mart or Target, these were the hand blown glass ornaments that had been dad’s grandmother’s and they were very special to him. Something that we didn’t quite grasp at 11 & 9. The tree was up, decorated and looking pretty good. Jay and I were very pleased with ourselves… Until… The tree did a slow swan dive onto the TV and then onto the floor. This was an AFV worthy dive, lights popping and ornaments crashing… dad’s ornaments. We had managed to destroy every one of dad’s ornaments, the ones we weren’t supposed to touch. We also broke a glass swan vase that mom had sitting on top of the TV. Ironic huh? I don’t remember if we forgot to tighten the bolts on the stand, or if we used the wrong stand altogether and it just couldn’t support the weight. Either way we took on something that was not ours to take on and this time we got into a bit more trouble than we did with the house of cards. Some things you just can’t fix with a few hours of sorting it out. Dad did forgive us and Santa still came that year. Out of all the Christmases growing up, that is the tree I remember the most. I think about it every year as we decorate our Christmas tree.